A GLIMPSE INTO THE FUTURE? This conceptual illustration shows how Saranap Village might look when approached from the east on Boulevard Way (photo). Photo and illustration courtesy of Hall Equities Group. It’s just a matter of time. With its proximity to a thriving downtown Walnut Creek and two of the East Bay’s major freeways, it’s not a question of if but when the Saranap business district will be redeveloped. It appears that “when” may be soon, at least for part of the area. A Walnut Creek developer in April announced plans for a mixed-use project in the area clustered around the Boulevard Way–Saranap Avenue intersection. Dubbed Saranap Village, it would include retail shops at street level with multiple levels of apartments and condominiums above. Boulevard Way in the project area would be narrowed from four lanes to two, with angled head-in parking on both sides of the street in the “village.” Additional parking would be available beneath and behind the stores. Preliminary designs show two “traffic-calming” roundabouts, one near Flora Avenue, the other at the Saranap Avenue–Boulevard Way intersection. The latter, the larger of the two, would include a sculpture and/or fountain. A large valley oak tree now located in the parking lot of 1300 Boulevard Way would be replanted in the roundabout near Flora, just west of a “gateway entry arch” spanning the street. Current plans call for about 325 apartments and condos, ranging from five to seven stories, in three separate structures. Some of these would be for sale, some for rent. The number and configuration of these units could change, Hall Equities Group President and Chief Executive Officer Mark D. Hall told SCA board members at a May 2 orientation at the company’s downtown Walnut Creek offices. He noted that while the design of the project is continuing to evolve, one element the company is committed to is the market hall, which would be the retail cornerstone of the complex. The project would be built on the site of the old La Rossa’s Market; the property at 1300 Boulevard Way currently occupied by Sufism Reoriented; the vacant lot across the street from 1300 Boulevard Way and the office building adjacent to it; and the parcel where the Sandpiper apartments now stand. The project will raise property values throughout the area, HEG says. There exists “an almost blight condition in the portion of Saranap located along Boulevard Way,” the company says on the Saranap Village website. At these meetings and open houses and on its website, HEG has been actively seeking community input on various aspects of the project, including basic design features. There’s a survey on the Saranap Village website that gives residents an opportunity to share their views on the project. HEG has been laying preliminary groundwork on the project with the county but doesn’t know yet when it will submit its plans for review. The company plans to develop the entire complex at once and estimates that it will take about 15 months to build. Hall Equities Group is a private, family-run real estate investment, development, and property-management firm. Current and recent HEG development projects in Walnut Creek include Center Place South, bounded by Olympic, California Boulevard, and Botelho Way; the Arroyo apartment complex, near DMV; and Geary Marketplace, on the site of the long-abandoned Coop building near the intersection of Geary and North Main. The SCA is planning to hold one or more Community Meetings on the project once HEG has submitted its plans to the county, similar to those we held on the Sufism Reoriented and King Estate projects. Once the approval process begins, we’ll be tracking progress at our monthly board meetings and keeping the community updated on our website. The Saranap Village project will also be Topic A at our annual meeting in July. Learn more about Saranap Village and see renderings of the proposed development on the project website. 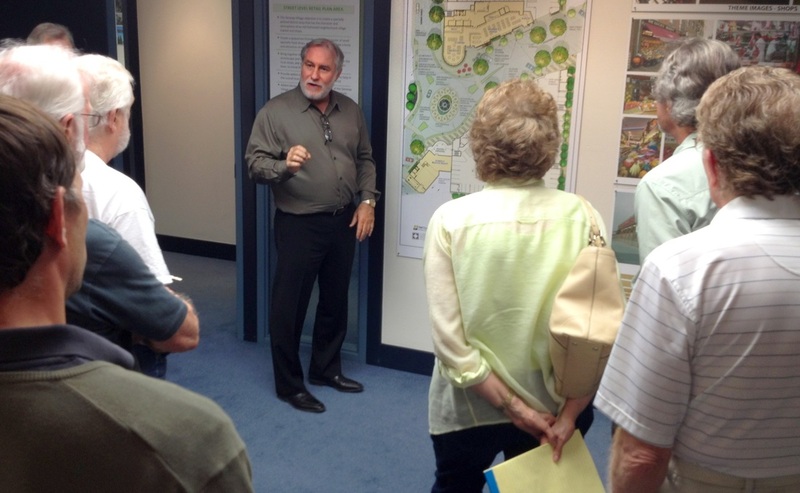 COMMUNITY OUTREACH Mark D. Hall, president and CEO of Hall Equities Group, discusses the proposed Saranap Village site plan with members of the SCA board of directors at a May 2 orientation at the firm's Walnut Creek offices.